I had to share photos from one of my best friend's wedding I was just in. I fell in love with the details at the reception. The best part was that as soon as you walked in you could see her personality shine in every element. And aren't those the best kind of weddings? The airy reception hall streamed light in off of Lake Geneva from the surrounding windows. The head table for the wedding party stood out under a paper lantern ceiling. Jewel tones throughout, from the dark purples in the flowers to the greens and blues of the collected vases highlighting florals at each of the tables. Bride and Mom spent the past year finding vintage looking vases of every size and color to fill up the tables. Table Numbers were indicated by Beatles Songs. Appropriate for the bride who walked down the aisle to a gorgeous rendition of Across the Universe. Flames not allowed, the candles are illuminated fakes. The paper candle holders are from an Etsy shop called ilLUMIEnate. Etsy was also utilized for some chair decor courtesy of PomLove. Mmm. . .look at that cake. The dessert featured a spice cake with pumpkin and white chocolate buttercream filling. The other was a lavender cake with raspberry and buttercream fillings. Decadent. PS. See that Jazz Trio in the background? One of the bridesmaids and her husband organized all of the music for the day including some soft jazz during cocktails dinner before the DJ kicked in. Don't you just love talented friends? As the evening set in, the lanterns above us lit up. And, although I did not get a photo of them, guests were treated to a thank you gift of caramel corn packages, homemade by the bride's aunt. Literally, the best caramel corn I have ever eaten. A public request for the recipe, Aunt Sylvia?? Or was this a secret family recipe? It was so wonderful to be a part of this day! The moment you've been waiting for is here. To find out if I survived the 5K. Thank you to all the well-wishers and supportive friends and family. You would have thought this girl was doing a marathon. Nope, not a marathon, just the first time I've ever actually run in my life outside of forced exercise in gym class. We have been lucky so far this fall and had very mild temperatures in Chicago. 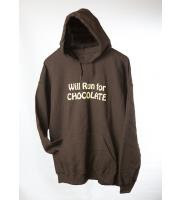 Of course, the morning of the Hot Chocolate 15K/5K decided it was going to reach a high of 40. The 6am wake up call and being in race position by 7:15 didn't help either. 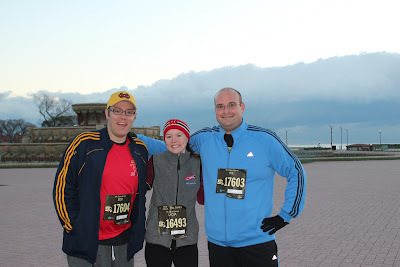 We powered through: Bob, myself and my brother-in-law Ike pumped ourselves up prior to the start at Grant Park. We queued up with 12,000 other runners, finding our way to the 12 minute mark start. 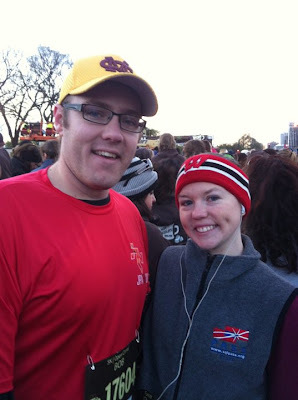 My Badger branded headband not only kept the ears warm and the hair in place, but also helped keep my ear buds in my ears. The race began and over 10 minutes later we finally got to the Start Line! The chips in our bibs didn't kick in until the start line so there were no worries on that affecting our times. What did affect my time? The congestion in some of the narrower parts of the course, walkers who did not move to the side or start further back and, oh yeah, the fact that I had never run more than 20 minutes in one shot! My music kept me going (a particularly well-timed "Under Pressure" by David Bowie and Queen got me through a tough section) and I was proud to say I only walked for less than a minute, and most of that was during the heavily congested areas. Of course, I was probably running slower than I normally walk by that last half mile, but once I saw that Finish Line I wasn't going to quit. 37:01 minutes at an 11:55 pace. Placing about 1300 out of 2200 females in my age group. I know I can improve on this in the next race, whenever that may be. The good news is I wasn't so worn out that I ruled out doing another one, I think I would gladly accept the challenge. The better news? Free chocolate and fondue at the end of the race! We had my sister's family over for brunch after the race and I smartly realized the night before that I wasn't going to want to be slaving in the kitchen when I got home. I spent Friday night preparing an egg bake and some insanely easy breakfast muffins you pretty much always have the ingredients on hand for. I meant to take a photo earlier, but we dug into it too quickly! Then I spent the next couple hours relaxing on the couch. The cats were also worn out from a long morning of running away from my one and a half year old niece who shrieks happily but loudly whenever they are in the room. Confession: this photo was staged. I am not actually asleep. I also don't think that looks like me. Perhaps I have a stunt double I don't know about. Confession #2: Blatant Product Placement for Coke. And so closes out the Grand Running Experiment! As you might recall, this all started with a bet that if Bob signed up for and completed the triathlon he was talking about, I would train for and run a 5K. He did it (read about that here), so the next week I bought shoes (read about that here), over the next two months I followed a running program with a few hiccups now and again (read about that here) and I perfected my playlist to get myself energized for the day (read about that here). Until the next one! After a year and a half, our IKEA outdoor table and the four chairs we bought from a restaurant supply site online were getting a bit worn out. The color of the wood was fading fast so Bob broke out the staining supplies last weekend and we had an instant refresh on our hands. After mucho sanding and just one coat of Home Depot-purchased wood stain we were back in business. The photos probably don't look as impressive - you could just as easily think that there was a shadow over the chair on the right causing it to look darker - but trust me, the difference is a noticeable improvement! Speaking of a refresh, I finally got around to updating the page links at the top of this blog this weekend. Look to the archives for lotsa recipes, DIY projects and holiday fun. Be sure to hit the links if you have some time or are looking for something specific! 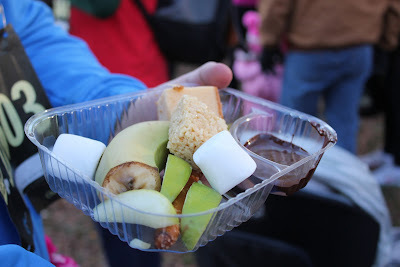 The Hot Chocolate 5K is this Saturday - am I ready for it? I think if I would have been able to get a full 3 runs in each week over the past 9 weeks I would be sitting quite pretty (sweat-covered, but pretty). Alas, life gets in the way so I fell a little behind in the frequency of the work-outs. The good news is I was able to push myself the last two weeks and increase from an 8 minute jog without stopping to a 21 minute jog before taking a walking break. Have I run a full 5K worth? Not quite. Am I worried? A little bit. Especially considering I always run after work and this morning was the first time I tried an A.M. exercise. The Hot Chocolate Run will kick off at 7:40 in the morning so I figured it was good practice to try this morning. Sadly, I got a side ache (which I've now discovered is called a side stitch) after only a few minutes. Yikes. Haven't gotten one of those since the first week or so of running. I'm planning on getting up earlier, eating something and drinking some water to hydrate. Also pay closer attention to my breathing. Hopefully taking those things into account will allow me to not keel over in pain right after starting the race. Although, it would be a pretty funny sight to see if the starter pistol (or whatever they use nowadays if pistols have fallen out of fashion) goes off, I make it three feet and then fall down crying out in pain and exhaustion. So what has been keeping me going through these runs? A solid iPod mix. My iTunes personality is more Jack Johnson than Jock Jams so I had to get creative with the songs I was adding and focused on ones that had a solid beat throughout I could pace myself at. I also got the great advice to pick songs that are close to the minute marker so that I can use it to gauge how far I've run. Goodbye Kitchen Timer! I'm feeling a bit more confident than I did after this morning's disaster - and everyone keeps telling me the adrenaline of the race and all of the people will energize me. The odds of me being dead last out of 25,000 participants is slim, right? . . .. right? I'll check back in with you post-race!